Children tend to be enthusiastic about everything and when it comes to their bedrooms, they would do all they can to give it a pleasant design. Why not, therefore, help kids accomplish their goals by gifting them with wallpaper and borders that should help them give their chosen theme to their bedrooms. 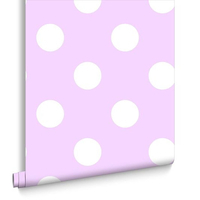 On trend and modern print for a little girls or a young teens bedroom. 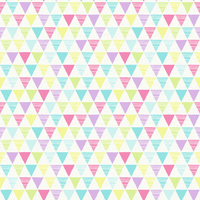 Harlequin style pattern in pastel tones of blue, green, pink, purple and yellow against a white background. 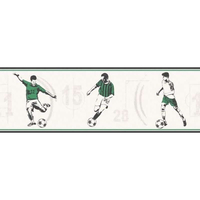 Wallpaper border featuring footballers in green shirts in different action shots, on a cream / beige background. Easy to apply using traditional wallpaper paste, this is also washable so any marks can be wiped off with ease. 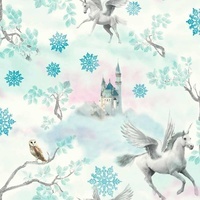 Features magical unicorns flying through clouds, falling snowflakes and fairy castles in the distance against a blue and pink background, decorated with glitter detailing. Add a touch of glamour to any room with this luxurious, crushed velvet style wallpaper with a textured, metallic lilac finish. 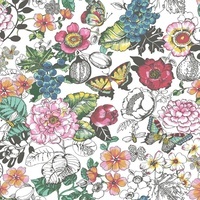 Botanical themed wallpaper with fluttering butterflies and buzzing bees against a background of flowers and plants, in bright colours with glitter detailing. 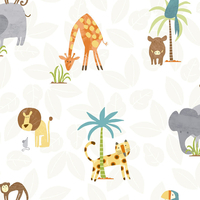 Cute jungle animals all in a row! 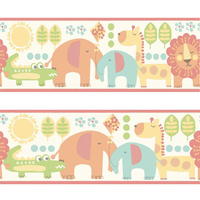 These pastel coloured animals fresh from the jungle featuring elephants, lions, giraffes and a crocodile with images of leaves, flowers and kites in the background make for a fantastic finishing touch to a little ones bedroom. 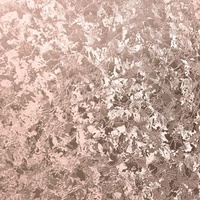 Add a touch of glamour to any room with this luxurious, crushed velvet style wallpaper with a textured, metallic rose gold finish. 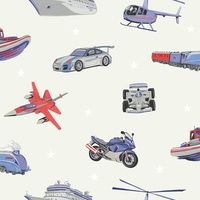 Transport design featuring a collection of retro style images of racing cars, motorbikes, helicopters and trains against a light grey background, printed with white stars. 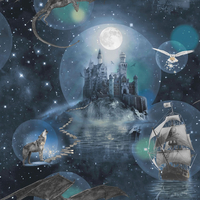 Magical and mysterious design featuring dragons, ghost ships and wolves with castles under the moonlight set against a dark blue background, decorated with non-transferable glitter stars. 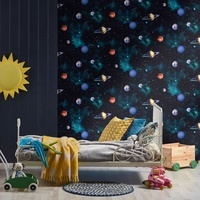 Perfect for any space and astronomy buffs, this fantastic wallpaper has a deep blue, star covered background with lots of planets all over. 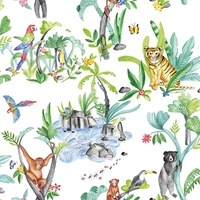 Featuring a collection of cute jungle animals, including elephants, giraffes, leopards, lions and monkeys munching on grass and standing under trees. The background is white with a print of natural coloured leaves. Featuring colourful T-Rexs, Pterodactyls, Stegosaurus and other dinosaurs roaming around the trees and plants, leaving trails of footprints. Blast off into space with the astronauts to explore the planets. 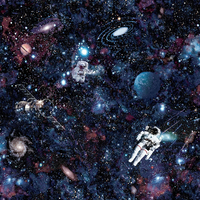 Space themed wall covering with a deep blue background full of dust and gas clouds, galaxies and stars. Orangutans are swinging from trees, tigers and parrots are sitting amongst plants, whilst hippos are in the swamps, surrounded by colourful butterflies and flowers. 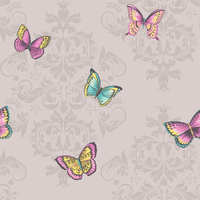 Classic damask pattern in grey with a modern print of fluttering butterflies in shades of blue, pink and yellow with glitter detailing. Features magical unicorns flying through clouds, falling snowflakes and fairy castles in the distance against a pink and purple background, decorated with glitter detailing. 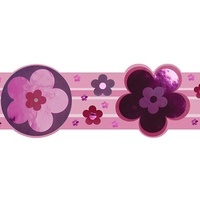 Diva Daisy, pink and purple metallic wallpaper border featuring a range of different sized flowers on a pink background. This border will definitely brighten up a room with its shimmering metallic daisies. 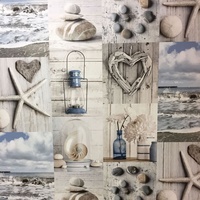 Collage style wallpaper with beach themed images of pebbles, shells, rustic hearts and waves in tones of blue and grey. Classic damask pattern in teal with a modern print of fluttering butterflies in shades of blue, pink and yellow with glitter detailing. 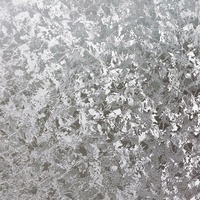 Add a touch of glamour to any room with this luxurious, foil wallpaper featuring a geographic pattern in silver on a textured silver background. 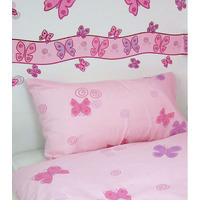 On trend and modern print for a little girls or young teens bedroom. 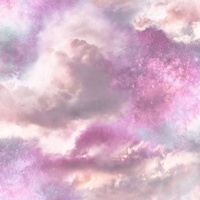 Features a cloud pattern in shades of pink and purple with glitter detailing to give a magical look. 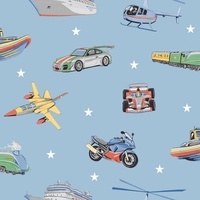 Transport design featuring a collection of retro style images of racing cars, motorbikes, helicopters and trains against a blue background, printed with white stars. 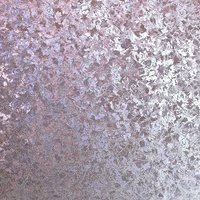 Add a touch of glamour to any room with this luxurious, textured foil wallpaper in silver. On trend and modern print suitable for any room. 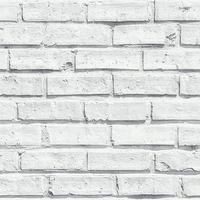 Features a classic brick pattern in white to give a contemporary look. With a paste the wall wallpaper and a cool, funky design updating your walls couldnt be any easier. 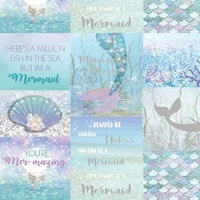 Stunning, patchwork style wallpaper with mermaid scales, tails and shells in shades of blue, green and purple with silver glitter detailing. 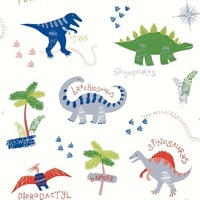 On trend and modern print for a little boys or a young teens bedroom. 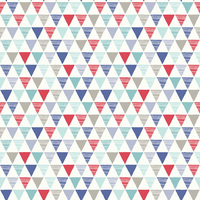 Harlequin style pattern in different shades of blue, grey and red against a white background. Magical and mysterious design featuring dragons, ghost ships and wolves with castles under the moonlight set against a dark purple background, decorated with non-transferable glitter stars. 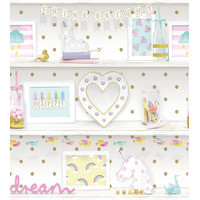 Pretty and girly design featuring shelves against a gold polka dot background, filled with picture frames, milkshake bottles and unicorn ornaments in pastel, rainbow shades. Add a touch of glamour to any room with this luxurious, crushed velvet style wallpaper with a textured, metallic silver finish. Classic damask pattern in cream with a modern print of fluttering butterflies in shades of blue, pink and yellow with glitter detailing. 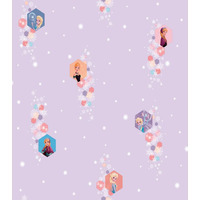 Disney Frozen wallpaper featuring the stunning sisters Elsa and Anna on a gorgeous lilac background with white snowflakes. Disney Frozen wallpaper featuring the stunning sisters Elsa and Anna on a pale blue background with white snowflakes. 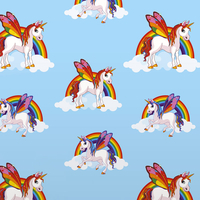 There are lots of bright colours on the lovely unicorns who are standing on fluffy clouds with rainbows behind them, all on a pale blue background. 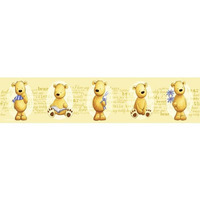 Featuring the cutest teddy bears against a pale yellow background. Some bears are wearing a blue scarf and others are reading a book or holding flowers. 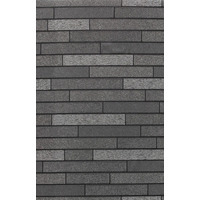 From the vintage collection is this foil black/ charcoal slate tile effect wallpaper. 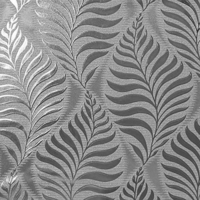 Add a touch of glamour to any room with this luxurious, textured foil wallpaper featuring a geographic pattern in silver on a black background. 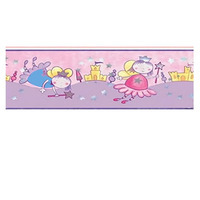 This Magical Fairy wallpaper border features the magical fairies with their silver magic wands, fluttering their shimmering wings over the distant hills where the golden palace sits high under the twinkling starry sky. Featuring magical unicorns with glitter horns, manes and tales, galloping across a pink coloured background which is decorated with fluffy clouds, pastel coloured rainbows and castles. 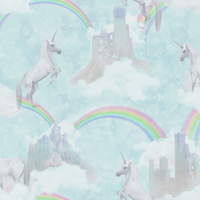 Featuring magical unicorns with glitter horns, manes and tales, galloping across a teal coloured background which is decorated with fluffy clouds, pastel coloured rainbows and castles. Children’s wallpaper is an important part of the room. It can help enhance the theme of the room or brighten up dull and boring white walls. 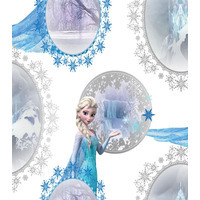 There are thousands of different designs and styles of wallpaper for you and your child to choose from. The selection is endless, especially when shopping online. There are a few important things to consider and remember when purchasing wallpaper for your child’s bedroom. 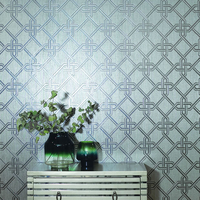 Style is probably the most important aspect to consider when purchasing wallpaper. If it is completely different from the rest of the child’s room then it can see out of place and messy or unkempt. It is essential to decide on the wallpaper before decorating the rest of the room and decide on a theme beforehand. Ask your child what kind of room theme they want and work hard to implement that into the design and decoration of their room. This can be done by using wallpaper because that is an important part of the decorating. Different styles and designs have different effects on the feel of the room. Dark colours can make the room feel more serious and cosy and lighter colours can make the room feel bigger. Lots of designs can possibly make the room feel busy. Another thing to keep in mind is that children’s tastes and likes change very rapidly. Instead of buying a lot of wallpaper that your child might grow out of, you may want to pick a solid colour or simple design such as stripes that they will enjoy all the way into their teenage years. There are a few aspects to consider before purchasing wallpaper for your children’s room. Obviously, the first step in the process is to decide on what kind of style and design you and your child want in the bedroom. Try and envision what the wallpaper will look like and if it is something that will look good in the room. After deciding on this, you will need to decide if you want pre-pasted or non-pasted wallpaper. Choosing pre-pasted wallpaper for your children’s bedroom could be helpful because it is easier to apply and your child could possibly even help with the application of the wallpaper. This type of wallpaper has adhesive applied to it already so it is simple to apply. You will also need to decide if you want to stain resistant or washable wallpaper. This is a fantastic idea if you have a child. Many young children may draw or paint on the wall and this is a good way to ensure that the walls stay clean and looking good as new. 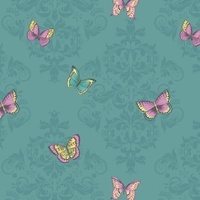 Wallpaper comes in many different styles and textures such as paper and fabric and a few others. Borders can also be used to go around the edges of the walls to add extra decoration to the room without a lot of extra work or decoration. The size is also an important part in buying children’s wallpaper. You will need to know the square footage of the room and the length and width of the walls. If you only wish to cover a certain part of the walls or only one wall then you will need to know the measurements of that area. Sometimes wallpaper is sold in one roll and so you may have to measure it out yourself and cut it to the desired length and width. You may have to buy multiple rolls or you may just need only a part of one because it all depends on how much of the walls you plan on covering with wallpaper. When purchasing children’s wallpaper, there are a few features to keep in mind. Washable wallpaper is ideal for children’s bedrooms because they can be cleaned when something gets on it such as paint or a spill. This also helps to save money in the long run as well. Wallpaper that is scrubbable can be washed and cleaned more thoroughly than washable wallpaper and will not be as damaged from the cleaning and scrubbing. Some wallpaper is textured or embossed which may interest your children and be more fun than regular wallpaper. There is wallpaper with faux landscapes and scenes on it such as a beach. These are absolutely perfect or children’s bedrooms because it invites them to use their imagination and they can use it while they are playing. It is also a great way to add to the theme of their room. Also, before purchasing the wallpaper, make sure that you know how to remove that specific kind and that you have the capabilities to do so. Buying children’s wallpaper may sound like a daunting task but it doesn’t have to be. Shopping online can make it very efficient and quick and your child can sit beside you as well. Sometimes shopping for these things in stores with children can be more work than it is fun so shopping together online is a good way to fix that problem if you face it. It is important to pick a design that your child likes and will possibly like in the future as well so that you don’t have to constantly alter and change the wallpaper. Decide on the specifications beforehand so that you will be less stressed out and can focus on the design only. The age of your children will probably affect if you get washable or scrubbable wallpaper to make cleaning the walls easier. Make sure to also measure the size of your walls and know the square footage so that you can accurately estimate how much of the wallpaper that you will need and know how much you will need to buy. Children’s wallpaper is a great way to spruce up boring white walls and add a little fun and excitement to their bedroom decorations. Wallpaper is a very popular decoration used in nurseries and children’s bedrooms all around the world and is something that many children will enjoy having on their walls.